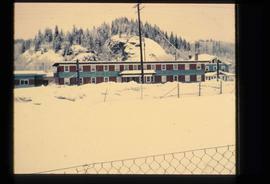 Overview of Giscome, BC showing built and natural landscape.Handwritten annotation in pencil on verso: "Bunkhouse & Dining Room / Giscome BC". 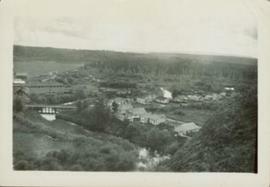 Overview of sawmill situated in valley. 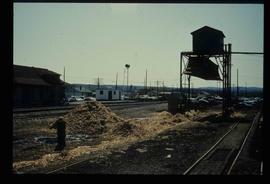 Finished lumber visible in distance. 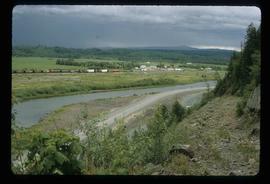 File contains slides depicting places along the east line of the BC Railway. 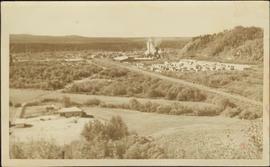 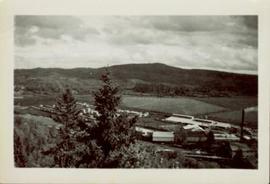 Some are duplicates of the images found in the "East Line, Dome Creek - Lamming Mills - Misc" file. 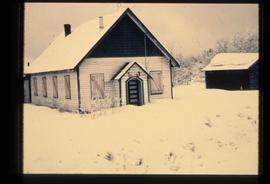 Image depicts a house on a hill in Giscome, B.C. 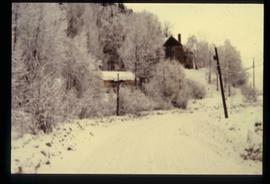 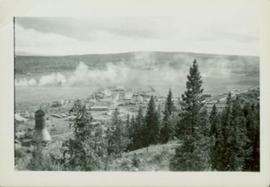 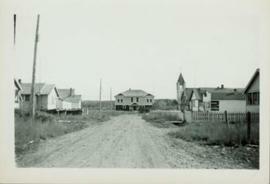 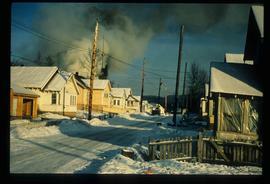 Image depicts a street of houses in Giscome, B.C. 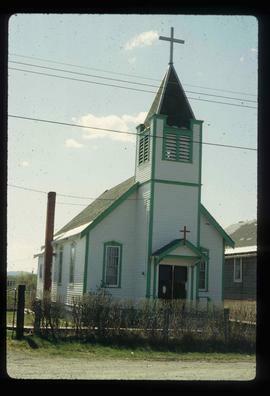 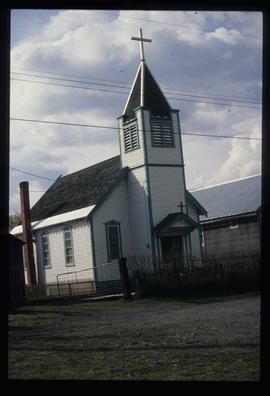 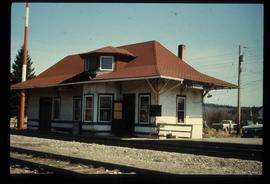 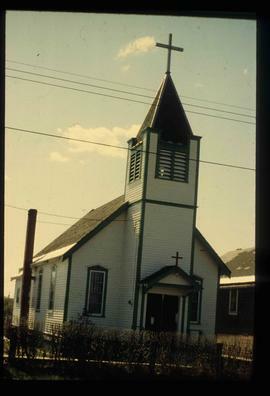 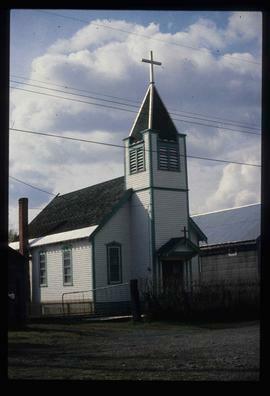 Image depicts the old CN Station in Giscome, B.C. 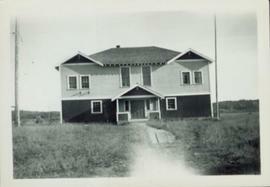 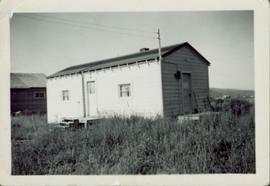 Image depicts the Giscome Community Hall. 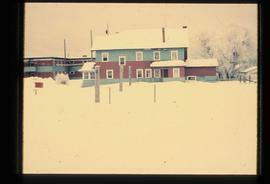 Image depicts a farm in Giscome, B.C. 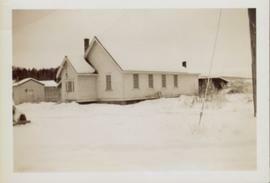 Giscome School – streetview along Brown Ave. 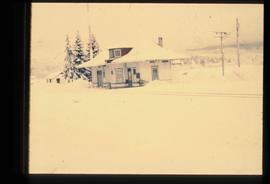 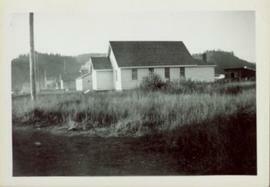 Image depicts the old Giscome Train Station in Giscome, B.C. 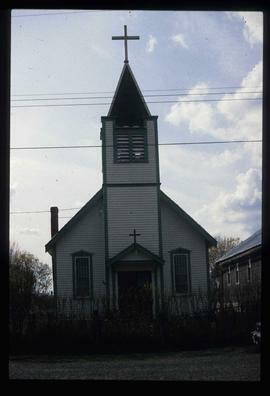 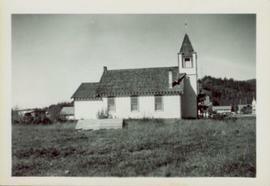 It was demolished between 1976 and 1977. 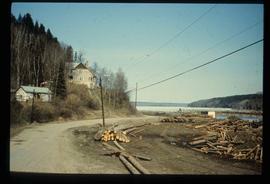 Image depicts a house on a hill, with Eaglet Lake in the background and numerous piles of logs in the foreground. 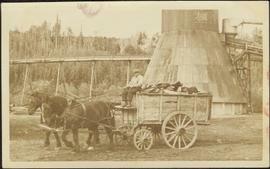 Man driving a two horse cart in front of beehive burner, cart is full of bark presumably sawed off the logs.Handwritten annotation in pencil on verso: "Mill Burner". 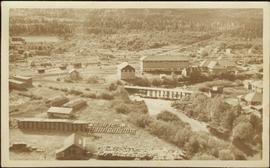 Overview of the Giscome sawmill behind road. 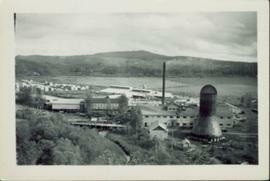 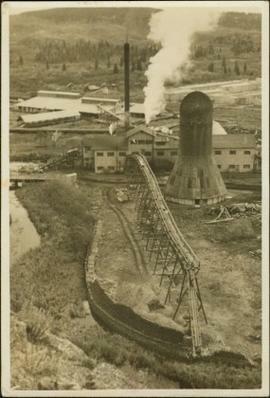 Lumber yard is visible in foreground while mill stands in background.Handwritten annotation in pencil on verso: "Giscome Mill / lumber yard in foreground". 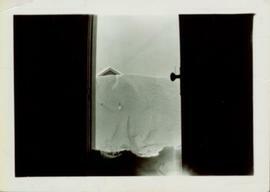 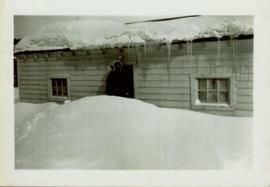 Photo displays the height of the snow on the front porch of the Giscome teacherage after a blizzard. 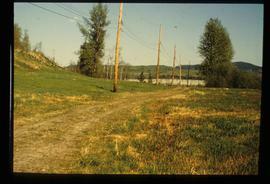 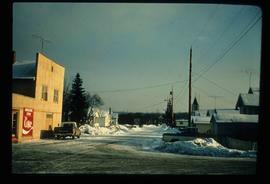 Image depicts a street in Giscome B.C. 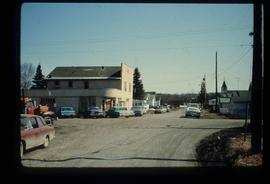 The Giscome Store is located on the left side of the image. 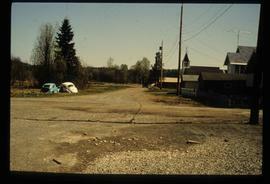 Image depicts a street in Giscome B.C. 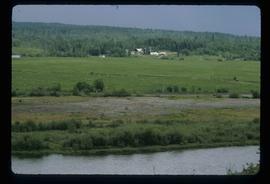 Two vehicles are parked in the ditch. 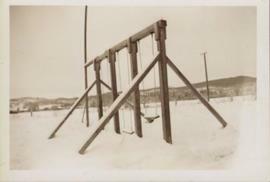 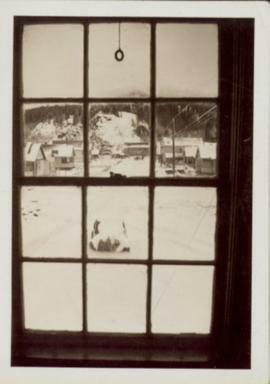 Bob White, a teacher, standing on the porch of the teacherage after a blizzard. 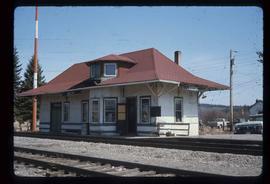 Image depicts a view of Giscome with a train passing through. 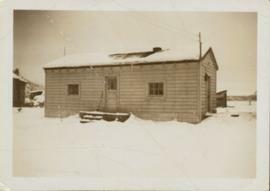 Handwritten annotation in pen on verso reads: “Looking out of our classroom window up the street.” According to the donor, the car stuck in the snow belonged to his colleague, Bob White. 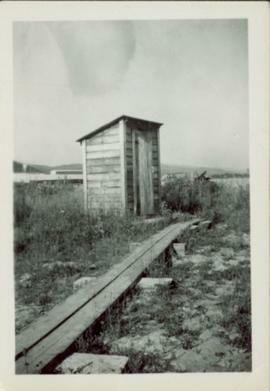 Image depicts what is possibly Giscome, B.C. 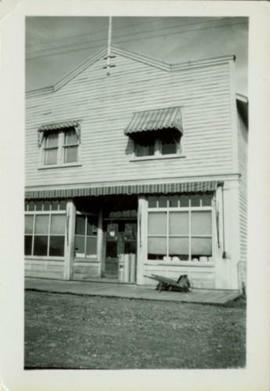 Image depicts an old, boarded-up building on a street corner with numerous parked vehicles nearby, possibly located in Giscome, B.C. 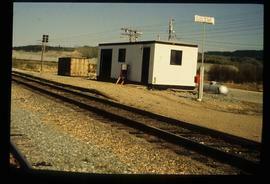 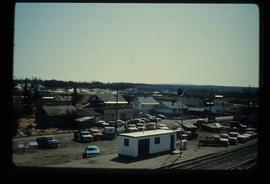 Image depicts what is possibly the CN Railway Station and tracks located in Giscome, B.C. 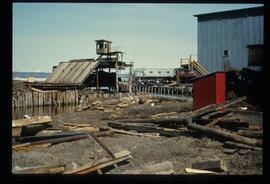 Image depicts what is possibly a dock at an inlet of Eaglet Lake in Giscome, B.C. 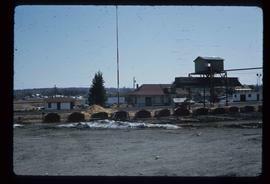 There are numerous logs and other pieces of wood scattered in the foreground.